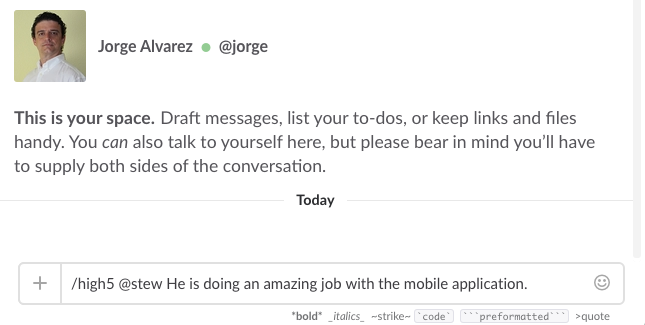 Slack is an amazing tool for communication. Like Happy Mood Score is perfect for teams with remote workers or distributed teams. We have integrated both tools so now you can use Happy Mood Score inside Slack. You can receive status update requests, provide feedback, send High 5s to your team mates and manage your 1 on 1 planner. Request mood status updates and feedback directly from Slack. Send a High 5 to any of your colleagues. Update your 1 on 1 planner with tips and ideas for your next meetings. Go to Happy Mood Score -> Settings -> Company and you will find a Slack button that will connect both applications. If you don't have a Happy Mood Score account you can create one for free. Detect engaged and disengaged people. Avoid losing your talent employees. Happy Mood Score and Slack are the tools every team manager needs.